Not very often do we get a photo of us together from a distance. We throw in the odd selfie occasionally just to show that we are still both here. But today I can treat you to a title photo. Who knows when it will happen again so let me indulge in using it. As usual I have got a little ahead of myself. Let me start at the beginning. 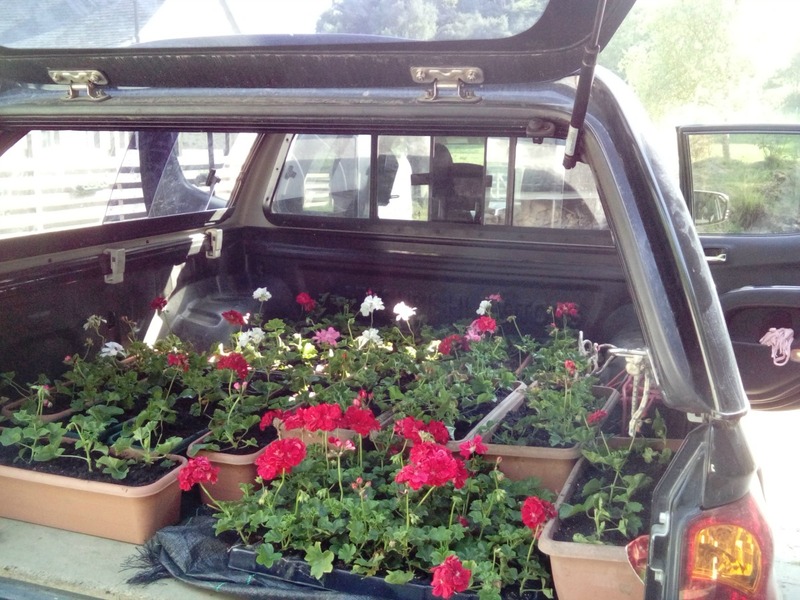 It was a beautiful sunny Sunday morning and, after a busy week of cleaning lodges, planting up window boxes and getting them to their final destination, it was a day off. 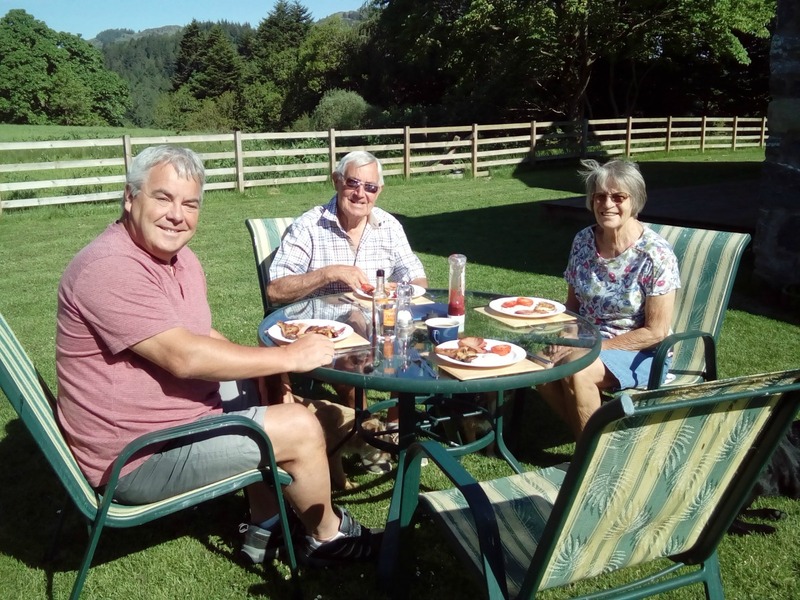 The parents of our HelpX hosts, Joan and Peter, invited us to a cooked breakfast on the lawn in front of the house. I tried to decline but they won me around as the smell of bacon wafted through the house. The plan was to send a photo of our Scottish al fresco dining to our hosts, Tina and Norman, who were not having such great weather in Barbados. It was a yummy breakfast and a brilliant start to our day. 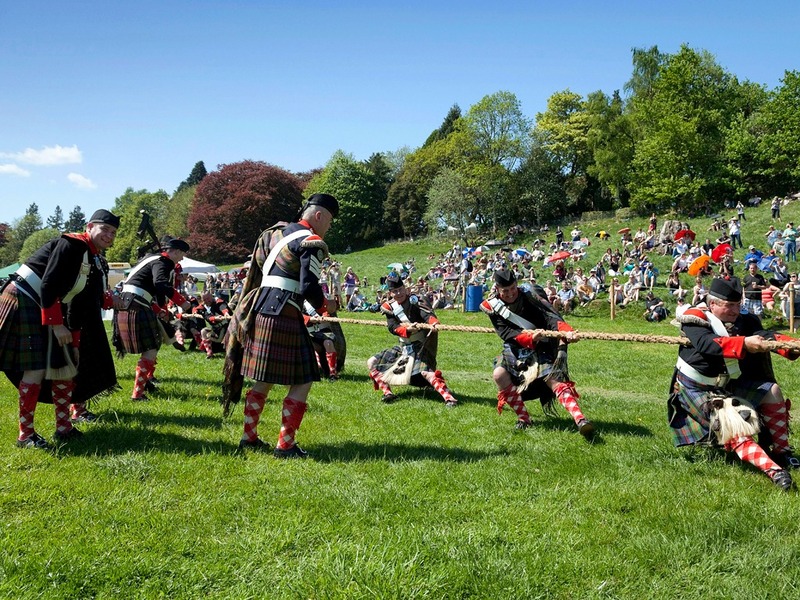 More commonly now referred to as the Highland Games but the games were originally a part of a gathering of a clan where piping, dancing, tug o’war, wrestling and the traditional events of tossing the caber, putting the shot and throwing the hammer. These events mostly tracked their roots back to ancient Scottish weapons and fighting techniques. The oldest games take place in Ceres in Fife. These were started under a charter from Robert the Bruce and date back to 1314. Quite a while ago! The Gatherings were stopped by an Act for around 40 years in the mid 1700s following the end of the Jacobite Rebellion which outlawed so many Scottish traditions, including wearing tartan. 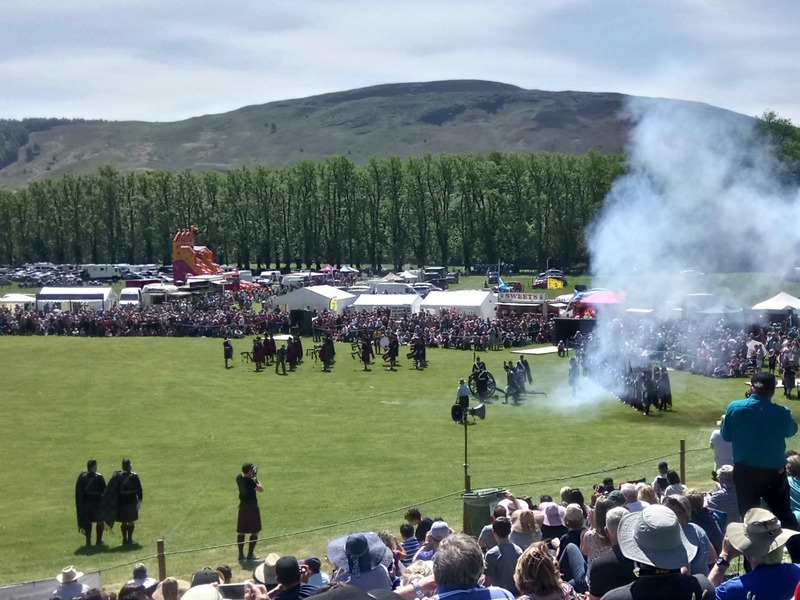 At Blair Atholl the Gathering always takes place over the bank holiday weekend at the end of May. 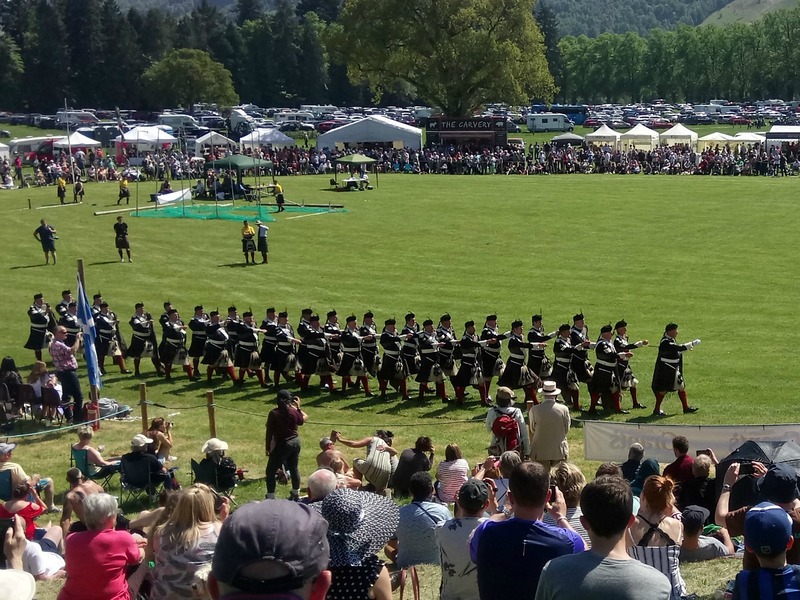 The Saturday is the Parade of the Atholl Highlanders with their pipes and drums, the only remaining private Army in Europe, and the Sunday is a short opening ceremony and the games. 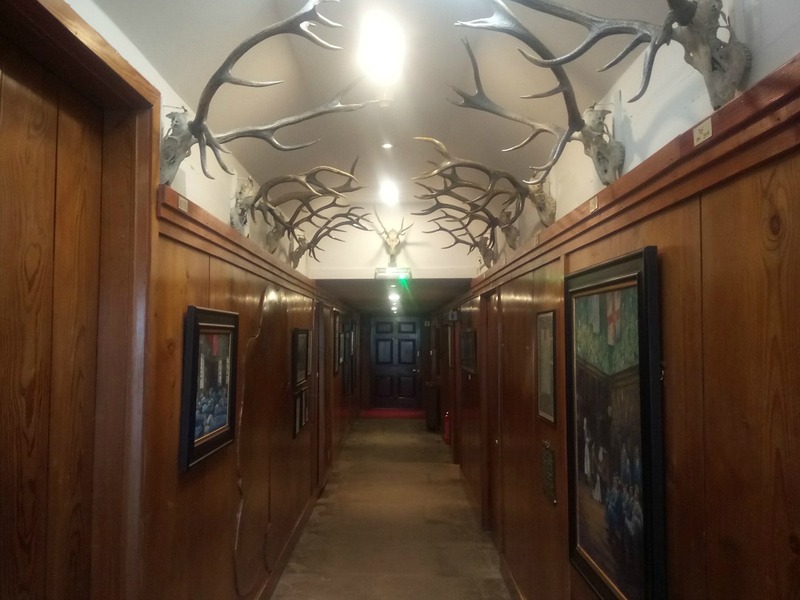 The Atholl Highlanders are under the command of the Duke of Atholl and it’s origin’s date back to 1777, although disbanded for some 50 years at one point, they were re-established a few years before Queen Victoria‘s tour of Scotland in 1844 and mounted the guard during her stay. I must add that we were a little disappointed to discover that the Duke and all his heirs now live in South Africa but they do come back to attend the Gathering. Perhaps that is enough of the history lesson for the moment but at least I have set the scene. 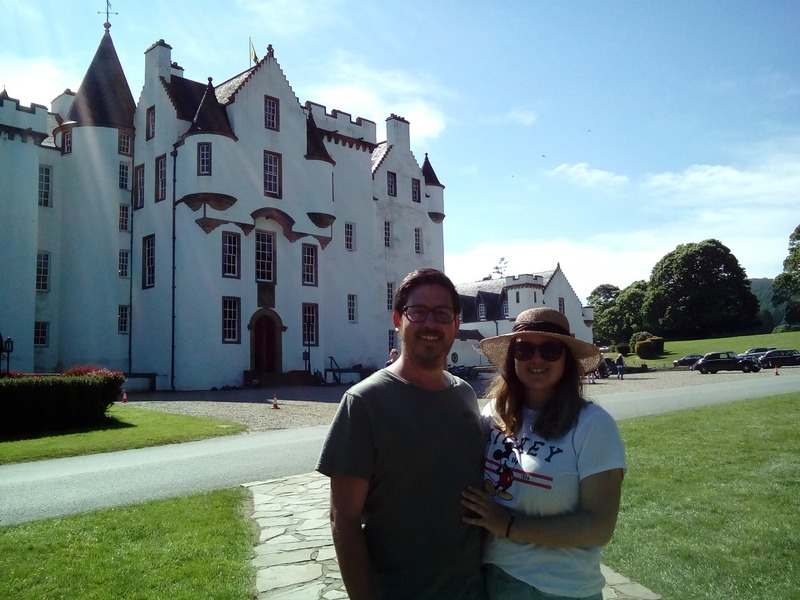 We asked if Brooke and Michael, a young couple from New Zealand who are also HelpXing here wanted to car share. It was a definite yes so with picnic blankets, sun hats and one random fold up chair we headed the 11 miles or so to the Castle. Entrance was roughly the same price as admission to the gardens at £7 so quite reasonable for a whole day. There were lots of stalls and stands to look around so we did some of that type of thing before setting up camp on the hill overlooking the arena. We had a good view looking down on the events. There are at least two or three events taking place at a time so there is plenty to see. 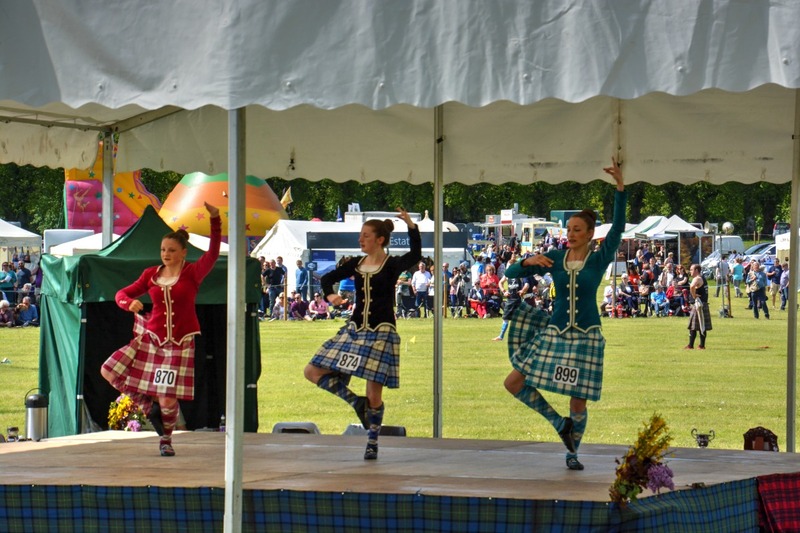 Highland dancing on one stage, hammer throwing in another but always with the haunting sound of the pipers taking part in their own competition. I think the highlight for me was seeing the Atholl Highlanders march on to open the games and blast their cannon. Interesting how they followed orders and commands to the letter and looked immaculate. This all changed when the tug o’war and relay races took place. I have never seen so much blatant cheating – it was great to see them letting their hair down in uniform – probably only a once a year opportunity. 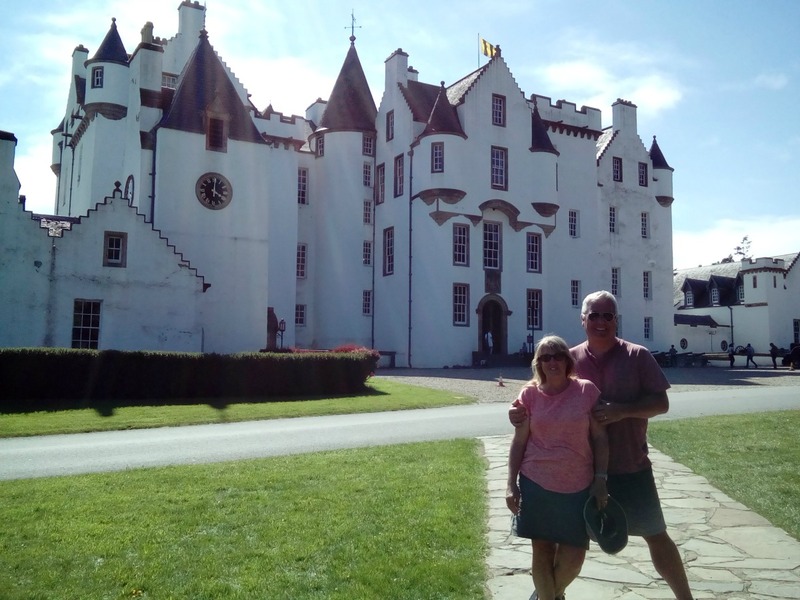 Before leaving, we decided to try and fit in half an hour to look at the Castle and gardens. On the way we had to pass the ice cream van, of course. We spent some time taking photos and ventured inside to see the cafeteria and shop but it was, by this time, nearly closing. As it is so close we may venture back so prepare yourself for another history lesson. We had a brilliant day out. Perfect surroundings, perfect weather but it wouldn’t have been the same without Brooke and Michael. We have the same sense of humour and thankfully they eventually understood the words “sporran” and “satsuma”! We hope they enjoyed it as much as we did. What a fascinating round of events – dancing, cannon blasting, and tug-of-war all in one! Are the Atholl Highlanders part of Scotland’s official military or ceremonial only? It was fascinating. The Atholl Highlanders are not part of the official military but they are a legitimate private army who carry arms. 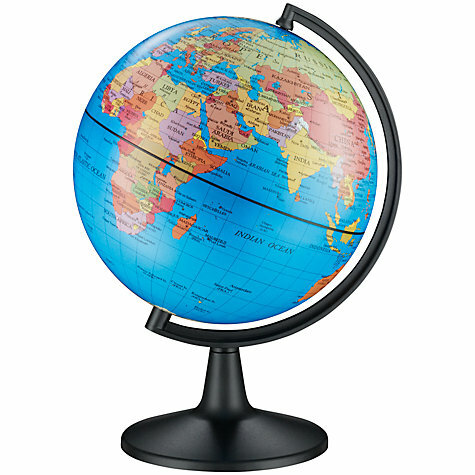 They are not purely ceremonial but do take part in a lot of events at home and abroad. Hope that helps. It does, thank you for getting back to me about that! I appreciate it. The weather looked perfect and for £7, good grief that’s so cheap! You must have gathered a fantastic number of photographs of your travels, what do you do with them all? Bargain memorial unique day out. We do have rather a stock of photographs from our many JWalks. We store them on an external hard drive and will one day print a very small selection. In our old age a photo album on my knee is much more pleasurable than a lap top. Choosing them is not going to be easy but will probably be more of people than places. Top blog Jo. 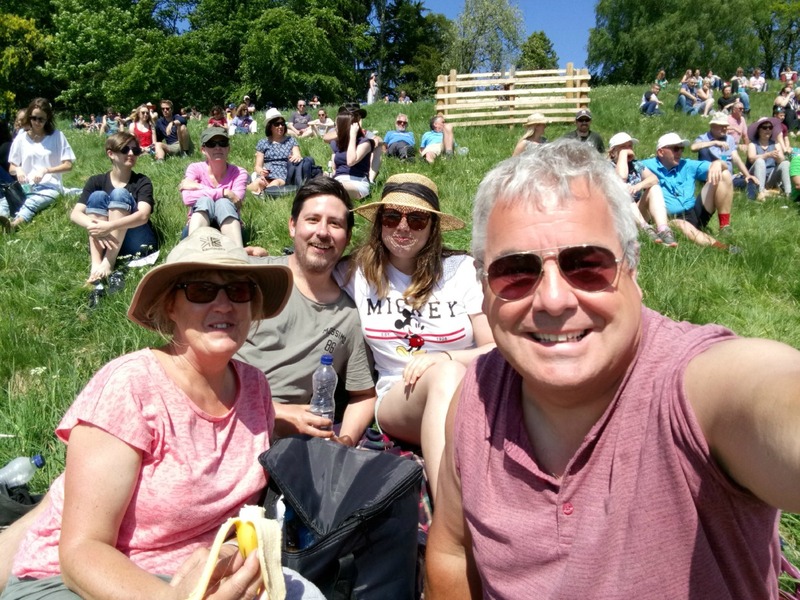 What a cracking day out and so much better value than the staid, old county show at Detling. Then again the Scots always put on a good show and know how to party. We should learn a thing or two from them before it’s too late. Ay tidy and mony a mickle maks a muckle! Looks like it is a brilliant day and such fun to share it with others. The tug of war really looks like it would be fun to watch. Crazy how 8 or 9 men on each end of a rope can raise the audience to fever pitch. Great fun! 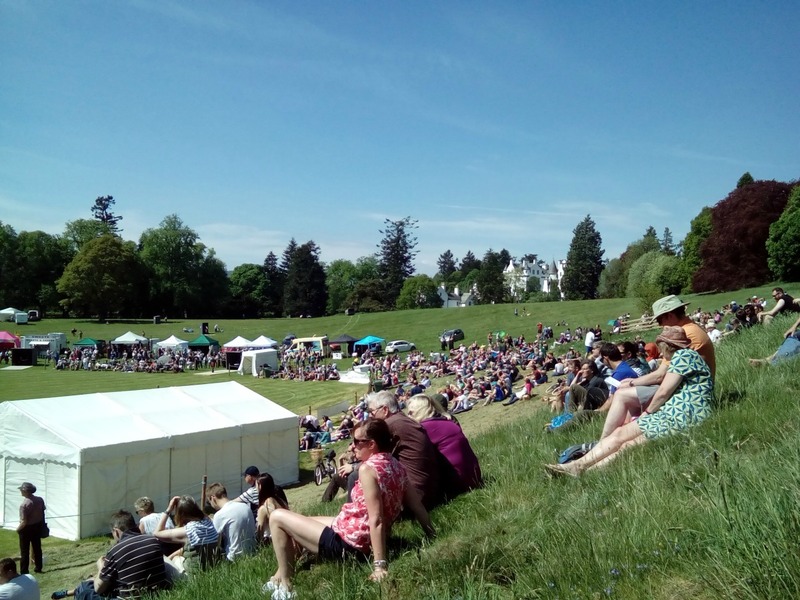 It sounds like you had a fantastic time… I’d love to go and see the Highland Games – they look like such fun to watch! It’s so entertaining with things going every way you look and against the backdrop of stunning scenery, haunting pipe music and families sharing picnics. What a good day out is all about. What a fantastic day. 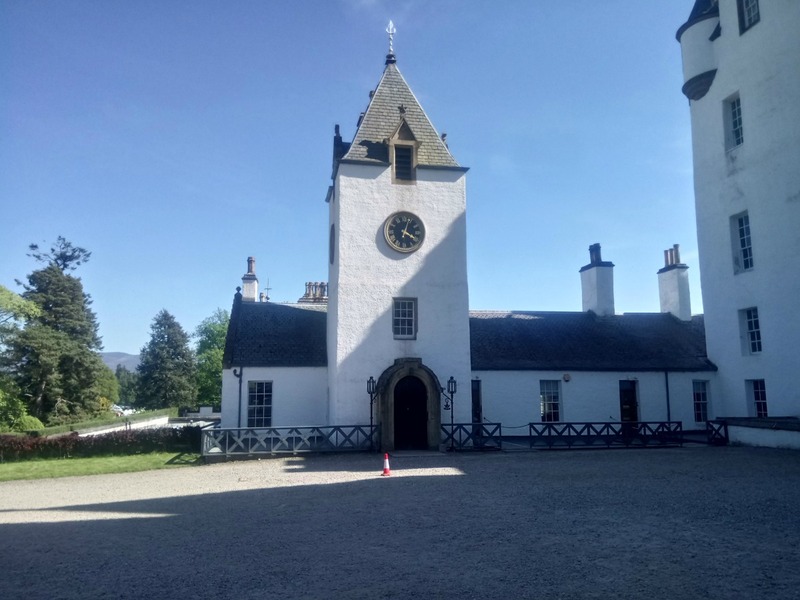 We have friends staying in the Pitlochry area at the moment but I haven’t heard if they went to the games. Loved that photo of you having breakfast on the lawn Jo, it looks so warm and the grass so green. It certainly is what the Highlands is all about. We felt very strange to eat breakfast on the lawn at 8am in brilliant sunshine. Who would believe it? 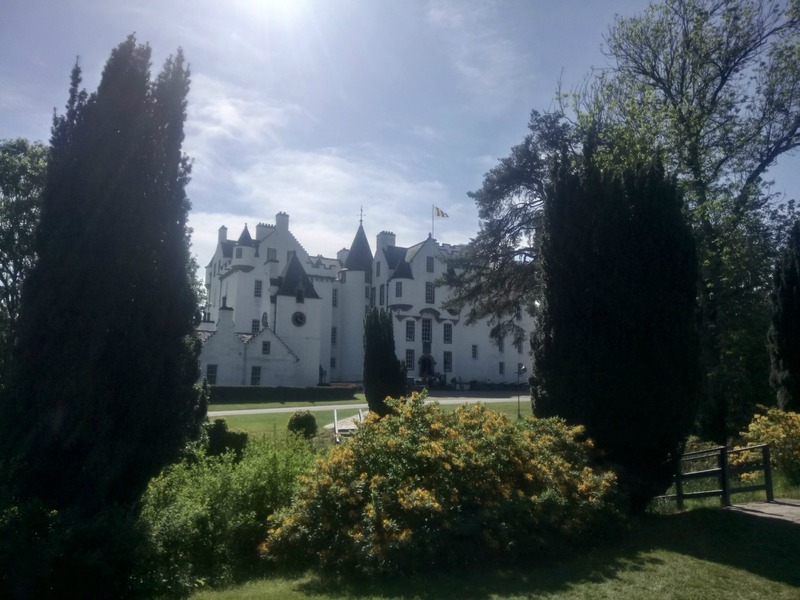 Hope your friends have had a good stay and enjoyed the blue skies of Pitlochry.